During the practical driving test, driving examiner has the choice of four test manoeuvres to choose from, one of which they will ask you to carry out. Whilst carrying out a manoeuvre, it’s important not to hit the kerb as doing so possess a significant risk to failing the driving test. The parallel parking manoeuvre in particular represents the highest risk manoeuvre in terms of hitting the kerb. Many tests are failed each year due to this fault and the reason is due to road cambers – or rather the learner driver providing an inadequate level of control over their car. Let’s take a look at exactly what a road camber is, and how to avoid failing the driving test at the expense of those road cambers. A road camber is defined by the varying differences in heights of the road. As can be seen in the diagram, the crown represents the highest point at the centre line of the road. From the crown the road slopes down either side to aid in water drainage. Without the road camber, the result would be puddles and standing water leading to road surface damage, cracks, potholes and has the potential to be dangerous for motorists due to aquaplaning. Road cambers are usually calculated at around 3 cm of road surface elevation per 30 cm of road width. Whilst essential for maintaining road condition and safety for motorists, it does represent a challenge for learner drivers on the driving test as the image above suggests. Most UK roads have the ‘A’ type of road camber where the highest point is the centre line of the road. Superelevated roads such as the diagram below are far less common. Typically used on motor racing tracks to aid in reducing the centrifugal force that race cars are subject to whilst traveling round a bend at high speed. Public roads that are high speed may also use this technique to aid in the reduction of centrifugal force and also water drainage. A superelevated road camber is also used on mountain roads where water drainage can only be directed in a single direction. 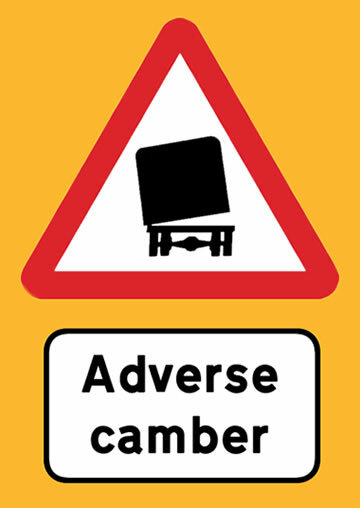 An adverse road camber is where the road slopes downwards towards the outside of the road. On a corner, approaching a left-hand bend, the left-side of the road will be higher than the right outer-edge of the road. On a right-hand bend, the road slopes downwards out towards the left side. Adverse road cambers can be particularly hazardous to motorcyclists, cyclists and to a perhaps slightly lesser extent, car drivers. The only sure way for a learner driver to deal with road cambers during the driving test, such as carrying out the turn in the road for example is to use the clutch biting point if in a manual transmission car. It’s essentially the same as a hill start. At any point where you feel that the car may roll due to either an ascending or descending road surface, you must apply the handbrake and locate the clutch biting point to prevent rolling of the vehicle. For further help to avoid rolling into the kerb, see clutch biting point, clutch control and how to do hill starts.